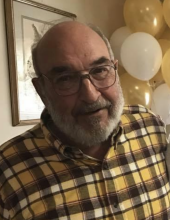 Willard Daril Rose , age 75, of Devils Creek Road, Corbin, Kentucky departed this life on Monday, December 3, 2018 at his home. He was born on May 31, 1943 in Whitley County, Kentucky to the late James Garfield Rose and Inis Marie (Hinkle) Rose. He was also preceded in death by his daughter, Stephanie Rose; sister, Betty Karr; brother, Curtis Rose and his mother-in-law, Opal Terrell Pfoff. Daril was a veteran of the United States Army, he was a believer and follower of Jesus Christ and a listener of Shepherd’s Chapel. He was an avid outdoorsman and a loving husband and father. He is survived by his loving wife, Carol Madge (Smith) Rose of Corbin; beloved daughter Sandra Rose Staton (Jake) of Albany, Kentucky; beloved son, Timothy Collins (Lisa) of Flatwoods, Kentucky; two sisters, Doris Ellis (C.J.) and Eva Rose of Corbin; and a host of other family and friends to mourn his passing. In Lieu of Flowers expressions of sympathy may be made in his memory to Shepherd’s Chapel, P.O. Box 416, Gravette, AR 72736 or the Shriners Children’s Hospital, 110 Conn Terrace, Lexington, KY 40508. To send flowers or a remembrance gift to the family of Willard Daril Rose, please visit our Tribute Store. "Email Address" would like to share the life celebration of Willard Daril Rose. Click on the "link" to go to share a favorite memory or leave a condolence message for the family.